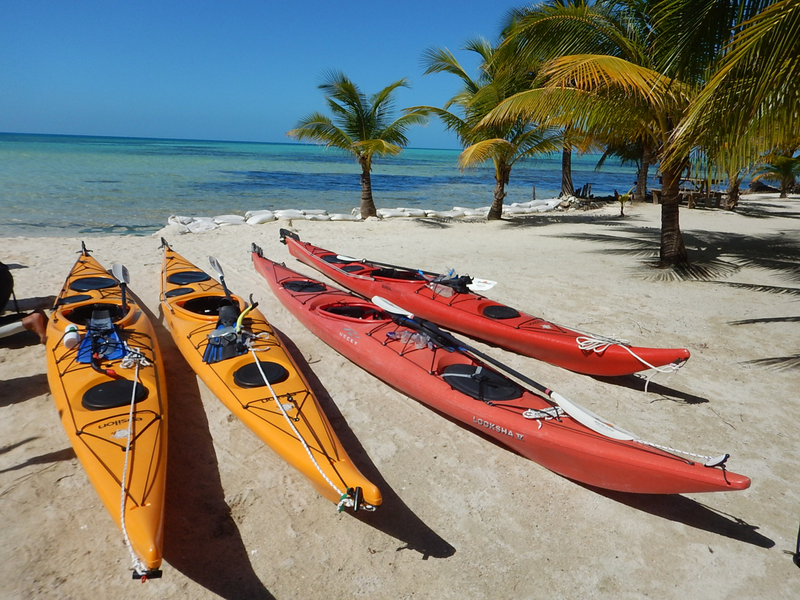 If any of you have ever read a North American canoeing or kayaking magazine there is a good chance that you will have seen an advert for sea kayaking in Belize and probably with Island Expeditions. We were looking for somewhere different, which offered the possibility of warm weather kayaking and so looked into Belize. 4 flights and two overnights, the are other options if you select other airlines but from the UK an overnight stop somewhere in the US is inevitable. This means that it is virtually impossible to visit Belize and to have some meaningful kayaking if you only have a weeks holiday. We used Island Expeditions based in Dangriga. You need to arrive in Dangriga at least a day before. There is not a lot to do in Dangriga although the town did grow on us during the time we spent there. All the people we met were amazingly friendly. There are a few small hotels in the town, a few of the people we met stayed in Pals Guest House, and seemed happy with it. We stayed at the Chaleanor Hotel, which was slightly more expensive but the rooms had efficient air conditioning and large roof top area where it was easy to dry washing and kit. We we’re also able to leave a bag there when we were away from the town for a few days. Island Breeze Bar and Grill – for evening meal and cold beers. 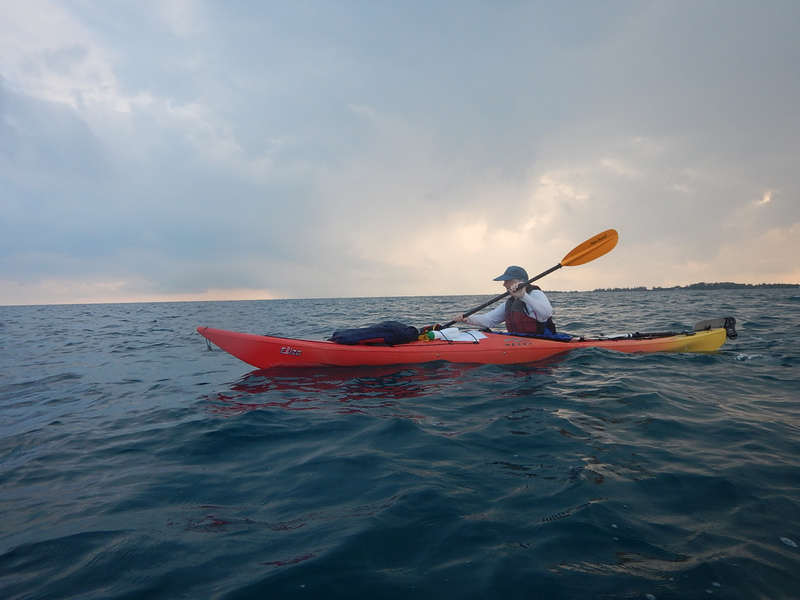 Island Expeditions offer a number of options including straightforward kayak rentals. If time allows I would recommend trying to fit in a visit to Glovers Reef. It’s not the cheapest option but what a fantastic location. If you fancy up market glamping with a some pretty simple sea kayaking and SUPing in an amazing environment then Glovers Reef Atoll is the place for you. The snorkeling at Glover’s Reef is simply quite amazing. They also offer guided paddling once back inside the main reef departing from Tobacco Caye. Some people like the assurance they get from a guided tour but in reality most people with some kayaking experience would be fine without a guide, as long as you can read a map or a GPS. The daily distances are generally pretty short, our distances didn’t reach double figures any day that we were in Belize. The waters are normally pretty calm, any swell is taken out by the reef and most the the time the winds blow from the north east so you plan accordingly. 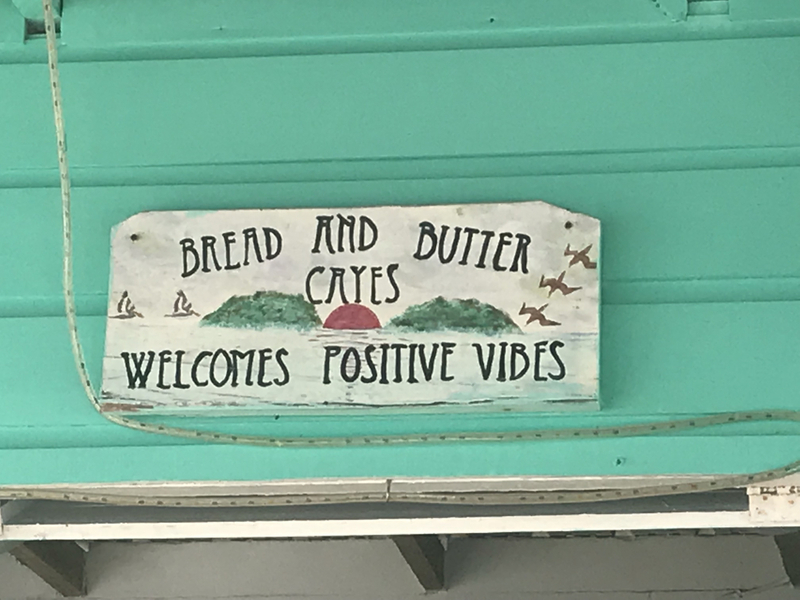 Food is readily available in Dangriga, we did take some dehydrated meals from the UK, which caused a few problems at Customs so I probably wouldn’t recommend that. Some people from Denver we paddled with for a few days also had similar problems entering Belize, so I would plan to buy all your food in country. Keep in mind that this is not a wilderness paddle so whilst we were kayaking the cayes we could have purchased a meal every night except one. The same applies to cold beer, which we did buy most nights. Generally I recommend singles as they give you a bit more flexibility although we were encouraged to take a double, which we resisted. I always thinks it’s easier to roll a single than to attempt to self rescue a double, in the unlikely event of a capsize. Normally when I travel I take my own Werner paddles, which I think you can’t beat, but for a number of reasons they were left at home so we used their Aqua Bound paddles, which we were fine for the distances we were covering. Their buoyancy aids (PFD’s) were great, I had a brand new Kokatat one, it was better than my own at home! The spray decks were thin nylon, but they did the job. The only other thing that we rented was a stove, they can be a problem to fly with a times and you never know what fuel is available at your destination. For example, we would have probably taken a gas stove, but didn’t actually see any gas in Dangriga which would have fitted our stove. The MSR we hired was perfect for our time out on the cayes. For camping a lightweight tent is fine, but remember to pack a few larger sand pegs, just to make sure with the corners. I took a lightweight sleeping bag but it never came out of the dry bag, it served as a very comfortable pillow. I did take a silk sleeping bag liner which was used on the last night. It seems somewhat contrary to everything we have learnt about kayak camping to leave the sleeping bag at home. In addition I didn’t take a fleece, I decided that if I needed one I would get in the tent but not once did I feel the need for anything warmer than a t shirt. Paddling kit is simple, shorts, a long sleeved top with high SPF, I have used a top from the Patagonia fishing range for years and found it to be perfect. Sun hat is essential and I have one with a long flap at the back to protect the neck. Crocs are the ideal footwear and were the only shoes I took, for both in the kayak and on the land. Clothing on the land is simple, another pair of shirts and a couple of t shirts plus another hat, just in case you misplace your main one. Sunglasses are crucial and I always have them on a floater. The basic thing about packing is pack light. Not always easy for paddlers who are used to more northerly latitudes. Old habits die hard. If you are spending time thinking about whether you need to pack something the answer is that you probably don’t need it. I think in the past it was probably easier to undertake multi day trips in the area but the proliferation of luxury resorts has removed some of the options. So in our experience the following is a suggested itinerary. Day 1: Tobacco Caye, especially if camping is available. If not decide whether you can afford to stay at the resort. 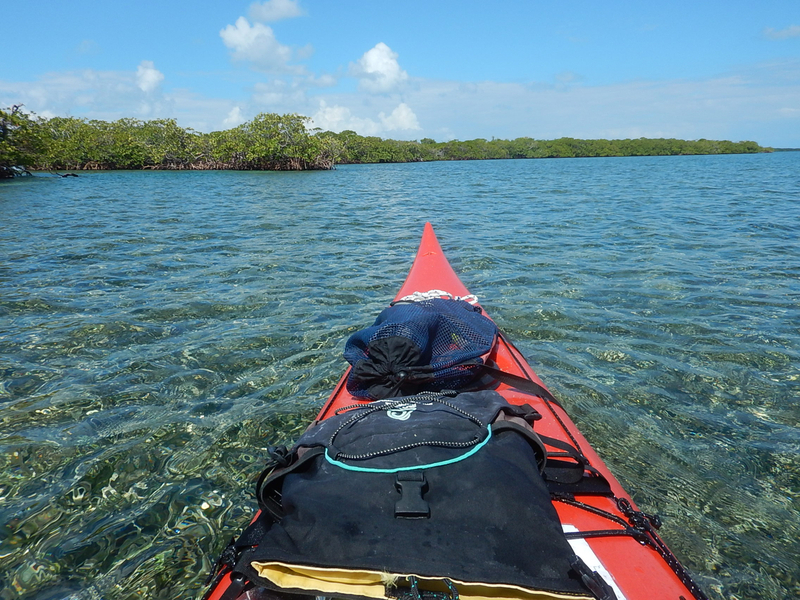 It makes packing much easier and gives you plenty of time to paddle empty kayaks over to Tobacco Range and explore the mangroves, looking for manatees. If you get an early start you would also be able to pay a visit to Man of War Caye to see the Frigate Birds and Brown Boobies. 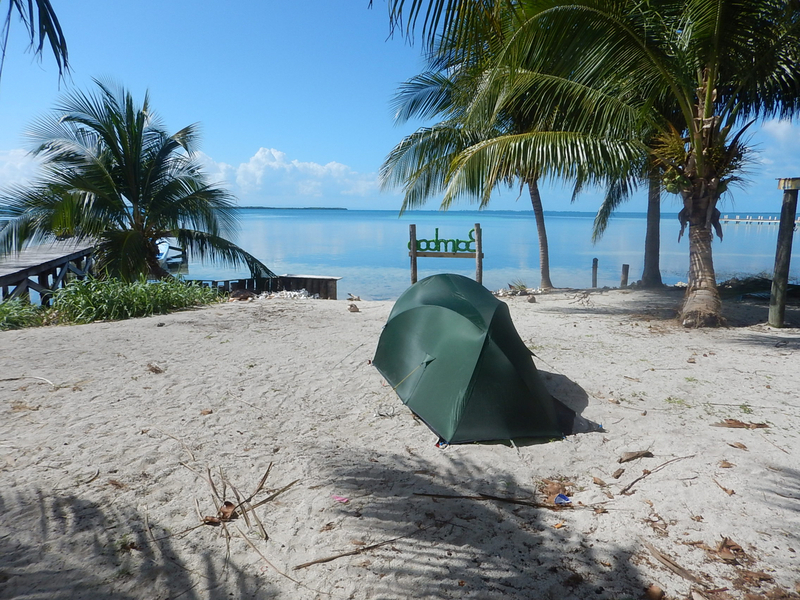 If staying on Tobacco Caye is difficult Head straight down to South Water Caye where there is camping. Day 2: If you stayed on Tobacco Caye paddle back to Tobacco Range, head south through the sheltered inner area before crossing to Twin Caye. Although not shown on the chart there is a channel running through the middle of the Caye, with some amazing bird life. Then head to South Water Caye for lunch and the night. If you had stayed on South Water Caye the first night head over to Twin Caye to explore that area and then back to South Water Caye for some snorkelling. 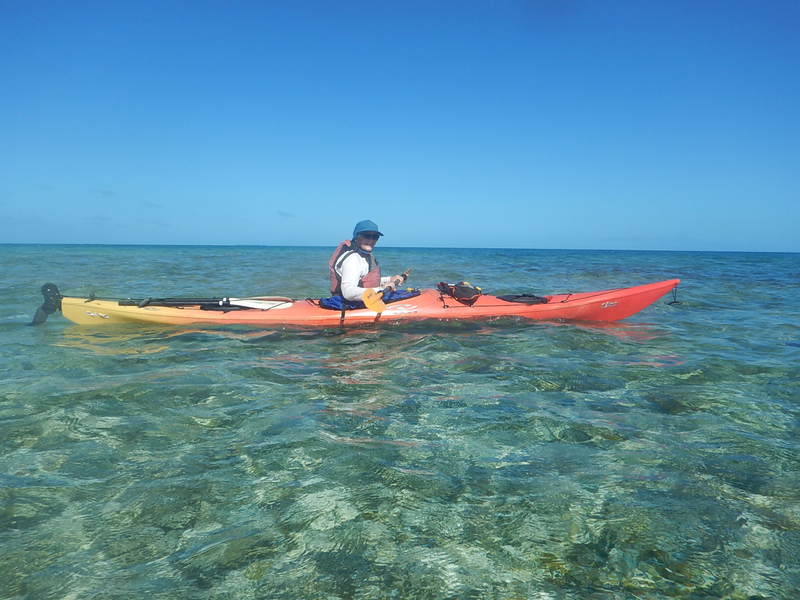 Day 3: Paddle back to Twin Caye and head north through the channels. From there head across to the north of the Blue Ground Range. Hopefully you will have a tail wind assisting with your crossing. It is possible to cross directly from South Water Caye but it is longer distance without touching land. Savour the paddle along the Blue Ground Range, the east and west coasts are both enjoyable, before landing at Billy Hawk Caye and putting you tent up. Day 4: Spend another night on Billy Hawk Caye and either switch to “Island Time” or go for another paddle around the Blue Ground Range. You won’t regret it, make sure you do call in at Bread and Butter Caye for a drink. I always enjoy tying up alongside the dock and climbing out of the kayak, just like a grown up with a big boat! Day 5: A day of options. a.) back to South Water Caye for the night then an early morning start on day 6 to get to Tobacco Caye for a lift back to Dangriga. b.) straight back to Tobacco Caye for the night and then the boat the following day back to Dangriga. Possibly a sensible option if the boat is in the morning. 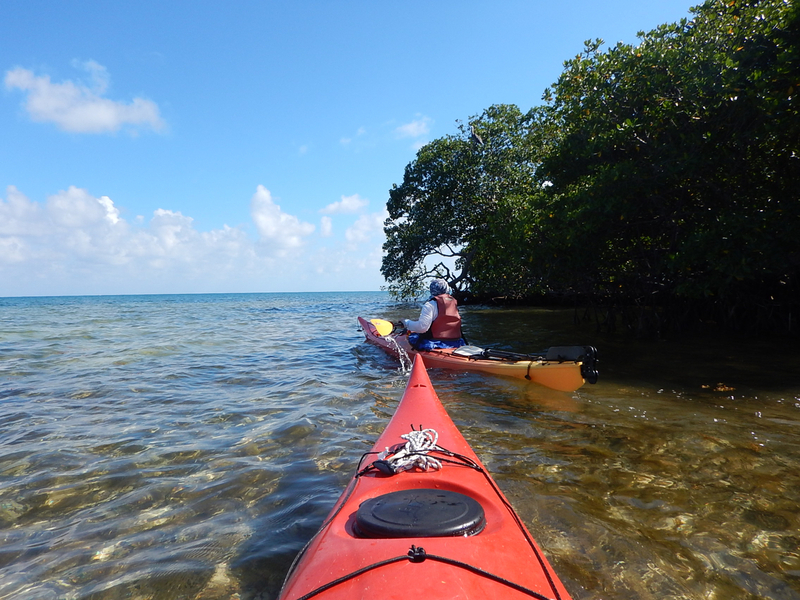 c.) a short day spent paddling in the area followed by a camp on Hangman’s Caye. This will leave a reasonable paddle the following day back to Dangriga, probably in the region of 13 nautical miles, some of which may be against a south flowing ocean current. Not impossible but allow yourself some extra time. d.) the risky option. Head north and hope that you can find somewhere with discreet camping. If that proves impossible the two options are back to Hangman’s Quay for the night or just bite the bullet and paddle straight back to Dangriga. A crossing of about 8 nautical miles. d.) drop your tent before sunrise and paddle back to Dangriga from a possible wild camp. Paddling in Belize is slightly more complicated for paddlers from Europe as opposed to those who are traveling from North America so if time allows try and spend a few more days in the country and experience more of what this lovely country offers. 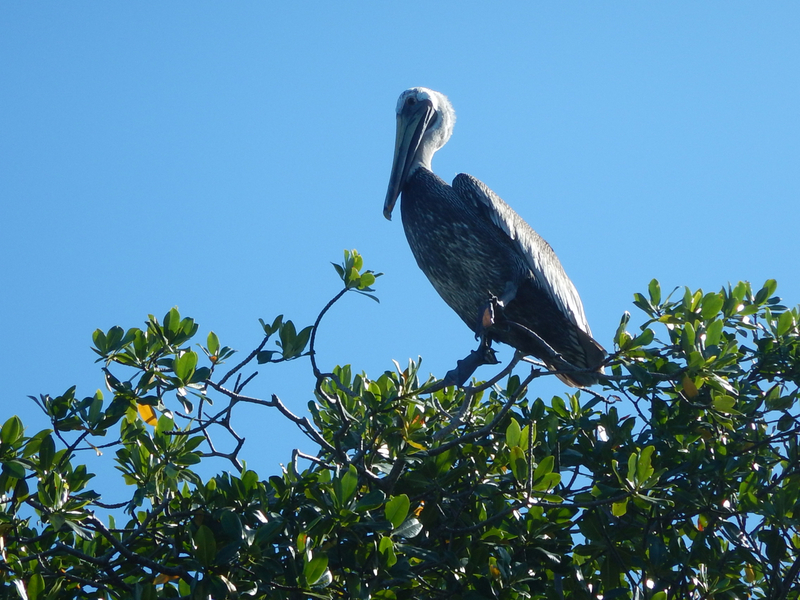 The rain forest is amazing, with a wide variety of birds and other wildlife. The first time that you see a Keel Billed Toucan or one of the species of parrots is always memorable. We also tried zip lining and abseiling (rappelling) down waterfalls. There is also cave tubing, wildlife trips etc. Belize also has a rich history so it would be a shame not to experience some of that aspect of the country. We went Alton Ha for the morning. There are a number of ways of accessing the Mayan site but we went in a private taxi from Belize City. We reckoned that it was about $25 more than going on guided tour but the great thing was we set our own timetable. Early pick up from the hotel, walking around Alton Ha before it got too hot, also for most of the time we were the only people there and as the tour buses arrived we were heading back to Belize City.